The Avantco F100 10 lb. electric countertop fryer is perfect for light-duty applications like delis, small sandwich shops, and concession stands. It is constructed of heavy duty stainless steel that's durable and easy to clean. A temperature control switch allows for adjustment between 120 and 370 degrees Fahrenheit. 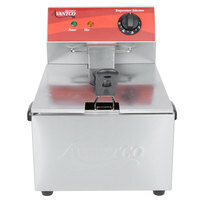 The Avantco single countertop fryer requires a 120V electrical connection. Excellent fryer. My first buy was almost two years ago and its still frying like its new! I currently have two now and they’re perfect for my small kitchen. We bought 2 of these for our sandwich shop for doing our fries. It keeps up when we are doing a lot of them, is pretty easy to clean and doesn't require the fire suppression hood. The price on them was great also. This is a basic countertop electric fryer that uses a standard 120v outlet. Fit our needs perfectly for frying diced potatoes for breakfast bowls and burritos. While it seems to perform well for our needs, I can see how the size and recovery time could be inadequate for larger volume operations. One thing to note is that the protective plastic coating is difficult to remove, like seriously a pain. This is a great fryer for a kitchen that fries minimally. It's small size makes it easy to move from place to place and to store as well. It is the perfect size fryer for us. Works as it should Keeps temp and is of good quality. Easy to clean and is safe. Will buy again if we build another truck. I was tired of using a fry daddy and needed an electric fryer and wanted one with a basket so that grease can be used more times. This is the perfect size and so portable to take camping or to a relatives house for fish fry. Just the right size for my kitchen. Heat up oil quickly. I use this for all my deep-fried needs. From candied pecans to deep-fried Oreos! Where has this fryer been my whole life? Ok I have never used a fryer before so I can't compare them with any other fryer--but all I can say is that using this is WAY better than frying on top of our electric stove top with a pot of oil! I love how quickly everything cooks and how easy it is to take a part and clean. I am really happy we bought this. Perfect size when you need something that is portable. I am a caterer and when a venue does not have a deep fryer this is easy to transport and does the job. I often carry it with me to events with a bag of chicken nuggets for the little kids. Sometimes they get forgotten about and when I say to moms I can make them nuggets they are so happy. It turns a crying kid into a happy kid. The electric countertop fryer is a great buy it saves time and you get a whole lot fried at one time, this is a must buy for any catering event. Highly recommended. This stainless steel fryer is easy to clean and oil get hot fast and this fryer basket is really good long handle and plastic grip on handle so it’s not feeling any hot. Works great. But is not meant for continuous cooking. Cannot raise temp quick enough after dropping in cold. So you get what you pay for. This fryer is great for small jobs and orders! It is easy to breakdown and clean and holds the cook temp pretty well. You just can't beat the price for this thing!! We haven't had this long but it heats up quickly and hold heats well. Fryer maintains temperature even as you fry things from frozen. Easy to clean. We're happy with it so far. We love this fryer. We brought this for our food stand. It is light weight and easy to clean. It fries fast and it gets really hot. We can my four order with one drop. The fryer looks exactly like the picture. Fried chicken and sweet potato fries in this fryer. Everything came out crispy and delicious. The oil can withstand high temperatures. I really loved using this fryer. I would recommend over the cheaper ones sold at other stores. Great for a small place. We use primarily for specials the we do and has held up great for the abuse we put it through. This fryer is an excellent value for those looking to add a small fryer to your operation. The temperature control is accurate and allows control between 160-370 degrees. Convenient product for frying small baskets of items or small desserts such as funnel cakes. Heats up relatively quickly (about 5 minutes) and fries evenly. Check the fire code in your area before ordering because it is considered open flame and may need to be kept under a hooded area. Wow, I absolutely love this product. Fits perfectly in your kitchen and can used for multiple tasks for your kitchen/ restaurant needs and wants, strongly recommend this for your kitchen. It’s a life saver. This product is very small. Doesn't work very well for a restaurant because of the size but it performs well for small size batches. The small size allows easy oil changes. Purchased this unit for a small catering job and it took almost 20 minutes to cook shoestring FF. I do not recommend this unit . Better off buying a $30 fryer . Nice quality Avantco 10 pound fryer. Great for smaller jobs. Used often for frying chicken wings in our catering business. It is a very nice quality fryer at a great price. I was concerned on the quality as this is a lower price unit but it is sturdy for the price. My two concerns: 1) The temp. know could have better heat marks for 350-350 for example and the plastic covering on the stainless steel was murder to get off. We bought this electric countertop fryer so we could make cannoli shells at home. Perfect size for a home kitchen, easy to store and won’t break the bank. One FABULOUS fryer! I bought this for my personal use. I have a large family and i love how versatile this is. It is the perfect size, easy to clean and store. For the price it's hard to beat. I keep it turned all the way up, and handles chicken wings just fine. If you don't need anything to big this unit should work. I have two of these fryers. I used them both recently at a wedding I was catering. I wish that the recovery time was faster, my brussels sprouts didn't come out as crispy as I wanted them to due to the recovery time and I had the fryer full. This fryer is great for light duty frying and/or smaller amounts of food. we bought this to be used for frying fish and seafood so we would not have to change the oil in a larger fryer to save money.works perfect. This is a great fryer. Never had any problem with since. It does takes some time to clean it up just like all other fryers so wear some gloves! Use, clean, fill, repeat. This fryer makes it easy! Love it and about to buy another one. You can't beat that price either! Highly recommended..
We use our Avantco fryer at least once per month for preparing appetizers for dinner parties. We can easily fit 2 lbs of chicken fingers in the basket and fry them to a crisp without dropping the oil temperature too much. We also use it to quickly fry home made corn chips and anything else we can think of. Most of the unit breaks down quickly for easy cleanup in the dishwasher. The electric components are not easy to clean unfortunately, and always have a slightly greasy film because we really cant wash them under hot water as we would like. All in all, this is a fantastic quality machine at a great price. If you dont have one, yet, you NEED one! We love this little fryer for frying all types of foods such as fries, tater tots, and even chicken tenders. It can't hold a whole lot but it has served its purpose and gotten us out of many binds. Great buy! We have large floor fryers, but needed an additional small fryer for our homemade donuts. This fit the bill and the space available perfectly. Holds a dozen of our small donuts at a time. Only worked for 8 months then died. They told me that it only had a 6 month warranty so i guess i loose. Buyer beware! I won't be buying anything from webrestaurant store anymore. I am very pleased with this Avantco fryer. Just what the doctor ordered. Money well spent. Webstaurant is a very good place to shop. A happy customer once more. Awesome fryer. Best Economy Fryer on the market. Great power. Low price and commercial level cooking. Best fryer I've ever owned. I get 14 to 16 chicken legs at one time. Takes about 16 minutes. Depending on size. Doesn't burn oil easily. Can sit in for hours. Heats up in about 10 to 15 mins. Steady heat. I love it. My friends have the same one and I love everything about it. You can't beat the price. Best website ever. Buy it you won't regret it. this is my 2nd fryer i purchased first one i got was the double fryer that i use for frying chicken wings and the other is now used for plantain or fries i owned the double fryer for a few years so a few months ago i purchased the single fryer and as the first one i am VERY satisfied with them. Doesn't reach set temp and Customer service is putting me through the hell to return & get a refund. I receive this unit today I was so happy until I got to use it. I put in oil and took the temperature after 30 minutes and it would only register at 320-330. I even waited an additional 30 minutes and still it's unable to reach the set temperature of 370....I guess to Webstaurant I should be happy with those result because Customer Service wants me to send a video of my reading (which I don't mind), but this a first time I've encounter something like this... I paid for something that advertises that it reaches a max temperature of 370, but what I got was a dud. It also doesn't recover well, when I added fries to this deep fryer the temperature drop to 310-315 and takes forever to go back up to 320-330 (set at 370). I should have listen to the bad reviews on this product.....totally useless for my needs, and worst Customer Service Support ever I've had to deal with. We got this small fryer to use for all of our sushi frying so as to keep fish flavors in one fryer. The fryer is small countertop size, and the basket is about 10 inches by 8 inches. The depth of the oil when filled to the max line is about 6 inches deep. The unit comes apart easily for easy cleaning. So far, we've had it almost 2 years and it still works great. Only reason I gave 4 stars is because the temperature dial isn't accurate, when you set it to the highest temp which is 375 it's actually only at about 325. Won't reach set temp and won't recover temp when food is added. First, deep-frying only matters between 350-380 degrees. I have no interest in, and no use for, a deep-fryer that fails to reach 360 and beyond, without food in it. Any situation where oil temp drops below 350 is merely ruining food by soaking it in warm oil. I properly assembled this unit, and the max temp reached after 45 minutes at max unit setting of 370 was 355 as measured by my $100 Thermo-pen digital temp gauge. I added a double-order of small raw Buffalo chicken wings (eighteen, to be exact, less than three pounds of food). The temp dropped to 306 and only recovered, after ten minutes of frying, to 321. This is not acceptable for true deep-frying. Sorry to say, I had my doubts as soon as I learned upon on delivery that this item was made in China. Unacceptable for true deep-frying. Based on my experience as a true craftsman deep-fry chef for thirty years, do not buy. Webstaurant, what are my options, here? Perfect small countertop fryer. Can basically put this ANYWHERE. I've taken the fryer to festivals and outdoor events. It's very lightweight and compact. Easy to use. Can't beat the size and price on this bad boy!!! Great small fryer, holds about 5 quarts of oil. Perfect for garnishes , appetizers etc. it's bigger than most home appliance fryers. Mine holds temperature well. Perfect countertop fryer for business or home use with little room.. Gets up to temp fast and holds it. Love this fryer and the amazing price. I like my F100 10 Lb electric fryer. It makes the perfect french fries. I us it at my house but it can be used in a commercial place too. Very good fryer. Great deep fryer for a great price! Reheat oil fast and keep the temperature. It's easy to clean or exchange oil. Finale product quality is great! Bought this fryer for an outdoor Bachelor Party. Got heated up in no time, about 15-20mins. Worked great! We made onion rings, fried goat cheese balls, and zeppoles. Everything came out great. Needs time to cool down when you are finished. I would definitely recommend this fryer to anyone. I have used it 3 times since I purchased the fryer a few weeks ago. All you need is oil, Canola worked fine, and an outlet. Make sure you have a place for the used oil after it cools down! Very dissatisfied with this item and Westaurantstores handling of the situation . If you are using for home use your warranty is void. Have only used twice for very light duty frying and unit will not maintain heat. When I contacted customer service I was told my warranty is void. Therefore I just wasted money. If this unit can't stand up to a couple of home uses how could it ever be used commercially? It is clear in other reviews that there is some kind of defect. Do not waste your money too!!!! Not the best product for the money. Doesn't hold much product and has had to replace it already. Not worth the money that was spent. It finally died after 3-4 years of use. I used this in my restaurant just for frying chicken and fish. I never has any problem. I wish it can last a few more years longer. Nevertheless, I still like it enough to buy another one for the replacement. I bought these fryers for a small catering event to do Chicken Parmesan in, and was just thrilled with the way they worked. Highly recommend this fryers to anyone. I havethe essentially same #F120 (the only difference between the F120 and F100 is that the F120 has a separate, illuminated On/Off switch which makes the green jewel light redundant). But they both need to have the orange light re-labeled: "Hot" does not mean it is up to set temperature, it means that the unit is still heating. It should be re-labeled to "Heating." I find the set-to-actual temperatures a bit high but accurate enough for practical use. In my tests, the set/actual temperatures (average of two thermometers and rounded off to closest 5F, full tank) are: 160/200 - 230/260 - 300/325 and 370/390. I've had the F120 for quite some time now, and it has performed to my expectations. we've had this deep fryer for a few weeks now and just love it. It works great. I had read were some said the temp. was to low on there's so I was concerned about this but I checked on this one and it is just right. I would recommend this to everyone. I have purchased many home fryers in the past and they have all worked OK. I used the Avantco fryer tonight for the first time and it cooked fantastic! I used canola oil to fry and everything was nice and crispy. I am soooo happy with this fryer and I'm sure it will last a lot longer than my past fryers and you can't beat the price. Can't wait to fry beignets tomorrow! We tried out our fryer for the first time the other night. Works great! It takes a few minutes longer to heat up compared to a gas fryer, but not too long. We tried several different food items to see how accurate it cooked compared to the cooking times on food label suggestions. It did an outstanding job. We are very pleased! Nice size unit, but does not reach temperature as advertised. I have an infrared temp gauge that I've used to verify the oil temp on this unit several times. Regardless of warmup time allowed, my unit will not exceed 334 degrees when the dial is set on Max/370. I'd like Webstaurantstore to send me another heating element to try before returning this unit. This is the perfect fryer for a small shop I use when I do corporate catering a it works amazing get hot really fast and the clean up is easy... it can only be used in a commercial building so don't use it at home or at a event held in someones home. I don't fry very often, so the size of this was perfect for me. The temperature controls are accurate, and the oil heats evenly and quickly. Very easy to use, though somewhat of a pain to clean. Also compact enough for home use without losing all of your counter space. Affordable, but after 3 weeks of low use, the heat was not enough to fry corn chips.. Do not buy this item, unless you want to waste your money!. This is a great little fryer. I used it once a week for over a year and never had any problems with it. I'd recommend this fryer to anyone who's in need of a fryer. It's great for donuts, French fries, funnel cakes, corn dogs, etc. Lots of space for a home fryer. This is a great countertop fryer. The basket fits nicely and sits flat inside the fryer. The timer is nice and it comes apart and its very easy to clean. This Avantco F100 10 lb. Electric Countertop Fryer is the most convenient and affordable fryer for food enthusiasts. This is a must have for the food service industry. Really like this unit. Heats up fast. Designed for easy cleaning. I don't get the chatter about the basket handle. Seems plenty solid to me. A very simple, nice fryer. One caveat, not a complaint. This is made for a small food service. I bought it for home use. It uses a lot of oil which makes it expensive to just fry up fries for two. None the less, it is great for parties. Everybody loves the appetizers. I've used it maybe a dozen times now. No problems. The hooks on the back of the basket are a nice feature for letting the basket contents drain a bit before emptying. Nice unit. We do a lot of frying and burned up a lot of consumer models. This thing is great, holds it's temp and I can do enough wings to where the first batch isn't gone before the second batch is ready. It is the envy of all who see it. We have messed around with many fryers for use in our home until we found this one. Its higher capacity oil size helps to eliminate temperature drop which results in greasy food. You will never regret buying this fryer. This fryer is the perfect size for frying small items, like donuts, waffles, french fries and more. I love that the oil receptacle is a standard half deep steam pan, which makes it easy to clean and swap out during busy service. Great little fryer. Bought for home use to cook for large family. Was able to fry 30 lbs of chicken in an hour and it was the best fried chicken I've ever made. Fryer is easy to clean and store. Best price and best product. Nice and wide basket, does not need a whole lot of oil, great for gas marts or consession stands of where no Gas (LP or natural) is permitted, even useful and convenient for big families. Worked great for us. We got one of these units to use for large family events and small catering applications and it's been fantastic. Everything is solid and the temp swings are non existent. I highly recommend this fryer to anyone who is looking for a light unit for small applications. The best part of this fryer is it is not expensive and is NSF approved. 120v and works great. Ideal for light to medium use although I have customers who use this every day without any issues. Easy to clean too. I've purchased both the single and double unit both work excellent. Just received this product and used it right away. It is a great tabletop fryer for light duty (french fries, etc.). The lid is fantastic and appears to be very durable. Highly recommend. I needed a small fryer for my outdoor house and this one is perfect easy to clean easy to store away and it cooks fast also great buy. We have been using fryer for a couple of weeks now for light duty applications and it is working better than expected. We would buy again. This is a great fryer. It heats up quickly and holds consistent temperature. It also comes apart easily for cleaning. I would definitely highly recommend. Perfect solution for a small kitchen. Cooks up fries within minutes and recovers quickly. The basket handle is a little flimsy, but otherwise a great item. Very nice fryer..especially when I cook for a family of 12..easy to use and easy to clean which is a great plus for me and great for concession stands...love it!! I have purchased a number of deep fryers over the years. This one is the best by far. It can fry 1.98 pounds of food at a time. It works extremely well. The only features that it does not have and I don't think either is necessary, is a timer and a drain spout for removing the oil. I'd have to say that if your looking for a great Deep Fryer that works fast with great results you should order this Deep Fryer. I ordered one and it works better than the one I used to have! Wish I found webstaurantstore.com much sooner! Great little fryer at a great price. Easily cooks up 18-24 wings at once. Maintains temperature during cooking and heats up quickly. Cleanup is easy. Perfect for minimal use, I would get a double well or larger unit if you do a lot of frying. This is def worth getting for home use! I've cooked plenty of chicken wings, french fries, and various other fried foods. It's also only 10 lbs! We use this in the concession trailer along with a double unit. It gives us the flexibility to prepare a wider variety of food in a minimal amount of space. what a great deep fryer. it heats up fast. will any thing, from chick whings, to fries. very easy to clean up,very well made . at a low buy. This is a quality table top fryer, we purchased this product to run dinner service out of a small cafe and it made the grade for sure. This is a neat fryer. Used it to fry french fries for 70 people at a dinner. I learned I need to start 1 hr ahead & keep them warm in the oven. It couldn't quite keep up with people coming thru the line. Great fryer for the price though. these are really nicely sized for demonstrations, or home use. Also convenient if you need to fry garnishes for one station separate from the fryer. Considering the tight space and minimal fried menu, this fryer was the perfect purchase for our kitchen. Considering its size, it makes clean up a breeze! Definitely recommend it! This countertop fryer is awesome for at home and it is great to fry alergy meals in at work! Heats up fast and holds the appropriate temperatures! The Avanto 10 Pound Single Countertop Fryer 120V is great. We use ours for frying the kids up their favorite french fries. It works great. The price is alsome. My family loves to use small fryers. We make chicken cutlets in it as well as sweet potato frys, mozzarella sticks, and even cinnamon churros! This is a great little fryer to have if you want something small but not expensive. Great for frying garnishes to french fries to fish, This thing does it all! The Avantco 10 Pound Single Countertop Fryer 120V Is great.It sits on the counter top, and dosen't take up to much space. It's perfect for any small restraunt. The price is right and it is easy to clean. I love using this fryer at home. It does not take up too much counter space in my kitchen. Also the oil heats quickly and evenly. Small fryer good for home use. I use this one at home and warms up quickly and evenly. I use it for a variety of products and they turn out great everytime. This is the perfect sized fryer for home use! Great for homemade chicken tenders or fresh chicken wings! Great to use for small offsite catering events too!! This deep fryer is a great tool to have in any kitchen. The temperature control is accurate and holds steady, allowing for consistent results. The fry basket is a bit small, so I tend to fry without it, but it does come in handy for some smaller foods. Cleaning the fryer is pretty simple as well. Highly recommended product. This is a fantastic addition to our restaurant. We have 2 full size fryers and use this for fish. Big enough, yet doesn't take up much room, and keeps a consistent temp. This is great. We have used it almost every night since I got it. I have set it up outside so we have no smell in the house from oil. It works perfectly. It's a great fryer. The best fryer I ever oened. It keeps the temperature you set it at during frying. Comes apart easily for easy cleaning. Great little fryer for small stuff. Quick recovery, and very easy to clean. Price was definitely good and shipping was very fast. Packaging was great. Nice cooker, not to big for a regular home kitchen or snack bar. easy to use cooks well with little cleanup.themostate controled and easy to get out basket with hanger to keep from dripping grease eveywhere. Steve W. Dothan Ala.
Great Product, will certainly buy again from this company! This company has many GREAT items and product lines to offer customers. Very fast shipping. Great comunications regarding tracking. This is an awesome deep-fryer. Simple to clean and the perfect size for the home. WEBstaurant is my favorite site based on their prices communications and quick shipping. Can't go wrong here. Perfect fryer for small operation. Easy to clean, even heat. Works great for delicate fried pastries or large batches of chicken. Great product for the price.